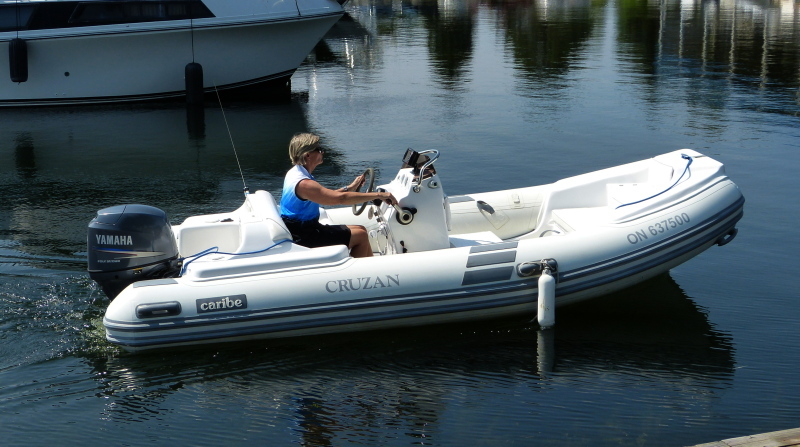 Deluxe Caribe DL15 loaded with features & options – Excellent Condition! Deluxe model deep-V hull gives a unique soft navigation experience. This Caribe DL15 includes a Deluxe steering console with windshield and Standard Horizon GPS, rear double seat with soft seat back & helm bolster seat. Storage galore … under both bow seats, under mid seat and passenger seat. Removable cushions for mid and bow seats and a custom cockpit carpet! Features include Hypalon tubes, a custom cover with zippered opening, keel protector, built-in fuel tank, fresh water tank with transom shower, built-in ice box, swim ladder, rod holders, electric manual/automatic bilge pump, aluminum trailer with spare tire and trailer jack.